If you haven’t noticed, a high-stakes global game of digital disruption is currently under way. It is fueled by the latest wave of technology: advances in artificial intelligence, data analytics, robotics, the Internet of Things, and new software-enabled industrial platforms that incorporate all these technologies and more. Every enterprise leader recognizes that, as a result, the prevailing business models in his or her industry could drastically and fundamentally change. A wide range of industries, such as entertainment and media, military contracting, and grocery retail have already been profoundly affected. No enterprise, including yours, can afford to ignore the threat. Yet most companies are still not moving fast enough to meet this change. Some leaders are still in denial about it, some are reluctant to upend the status quo in their companies, and some are unaware of the necessary steps to take. But these excuses are not good enough. 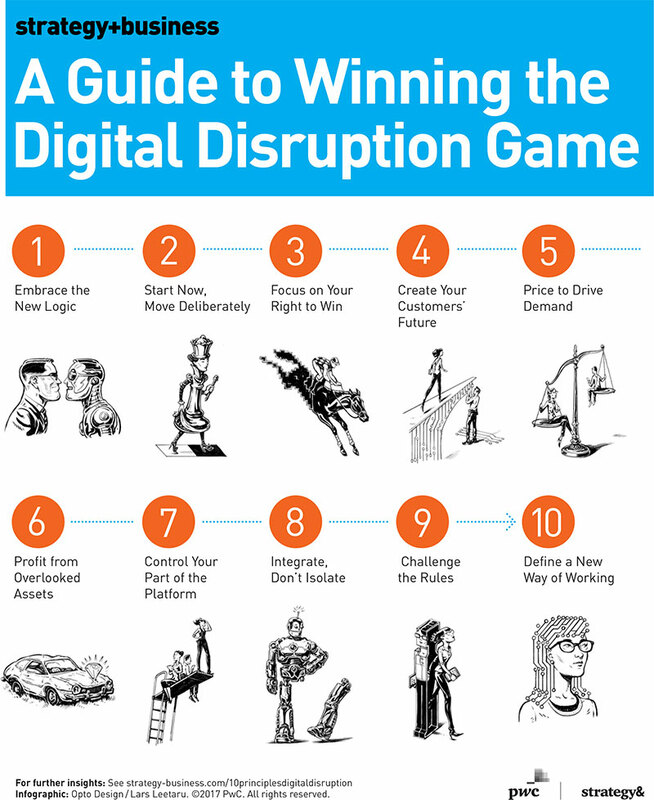 If your company is aleady struggling, then digital disruption will accentuate your problems. You may not have needed a plan for the new digital age yet, if only because it didn’t seem relevant to your industry. But you will need it now. Otherwise, no matter how well you run your business, it will not produce results at a scale that will allow you to compete. The companies with a clearly differentiated identity — those that stand apart from the crowd — are in the best position to thrive. For every company, this is an immense opportunity to rethink every aspect of the business, and chart a bold path for success. Disruption, by our definition, means a shift in relative profitability from one prevailing business model to another. The dominant companies, accustomed to the old approach, lose market share to a new group of companies. Not every disruption is driven by advances in technology, but this one is. And because the software fueling this transformation can be applicable across traditional industry and business function boundaries, competitors can emerge from seemingly anywhere. In sector after sector, new entrants are lowering prices, meeting consumer needs in novel ways, making better use of underutilized assets, and hiring people with broadly relevant digital skills, who have collaborative, creative, and efficient work styles. If you’re skeptical about this, it’s probably because you’ve seen digital technology appear before, without much of an effect on your core business. Even industries that feel pressure will not be completely trransformed. No matter how many people order their paper towels and canned soup online, for example, there will continue to be some brick-and-mortar grocers. But the wave of disruption that’s cresting now is more comprehensive and far-reaching than any previous wave. Consider what has already happened to less physically based industries, such as media and entertainment. They have had to rework their business models, seeking revenue through social media and new forms of consumer engagement. Industrial and manufacturing companies are following a similar path: embedding logistics systems with sensors, linking supply chains with shared data and robotics, opening the door to innovations in energy and materials, and changing the way that every product is made and delivered. Your shareholders (particularly activist shareholders), customers, and employees expect you to respond quickly. But panic and full-bore opportunism, in which you pursue every seeming source of revenue, will not work either. The answer is to develop a coherent strategy, seeking out the options that fit best with what you already do well. Here are 10 principles for accomplishing this, drawn from the experience of companies that have done so. 1. Embrace the new logic. When you first hear about a new digitally enabled competitor, you may tell yourself that company can’t succeed. It’s operating in a narrow niche, and it won’t be profitable at scale. Hundreds of executives of established companies have made this mistake, dismissing such innovations as the photocopier, steel mini-mill, graphical user interface, smartphone-embedded camera, and video streaming service. Instead, view each upstart competitor as a company you can learn from. Infographic: Opto Design / Lars Leetaru. ©2017 PwC. All rights reserved. There’s always logic behind a new entrant’s business model, a reason it is being introduced. It meets customer needs more effectively than you do (see principle number 4), offers consistently lower prices (principle number 5), or makes better use of assets (principle number 6). Chances are, it does all three. For example, Zume, which makes pizza to order in its oven- and robot-equipped trucks, delivers fresh, inexpensive food to people’s homes rapidly. As of October 2017, it had raised more than US$70 million in venture capital. Although no one can predict whether Zume or another contender will succeed, the general logic of vehicle-based fast-food represents a major threat to low-cost restaurant chains. The very existence of potential disruptors in your industry — especially if they are funded by venture capital — is a sign that your business model is regarded as obsolete. It’s up to you to figure out why, and how you can change it. The existence of potential disruptors is a sign that your business model is regarded as obsolete. It’s up to you to figure out why. In addition to studying your new competitors’ logic, look closely at the assumptions embedded in your company’s current business model. Keep in mind what you know digital technology can do for you. How could you redesign your capabilities to deliver better value than your competitors can? What aspects of your business model could you change to deliver better value, on a grand scale, than any upstart could? What would you have to do differently to make your own disruption work? Best Buy went through a thought process much like this, and became one of the very few specialty retailers to compete successfully against online retailers such as Amazon. Among the disruptive factors it had to deal with, as New York Times reporter Kevin Roose put it, was “showrooming: customers were testing new products in stores before buying them for less money online from another retailer.” Best Buy chose to disrupt its own business model with a price-matching guarantee, a renewed emphasis on customer consultations (building on its “Geek Squad” experience), new workforce policies to gain a more skilled and loyal employee base, and improved logistics that integrated its online and in-person experiences. (In effect, manufacturers now pay to be included in Best Buy’s “showrooming” array.) These elements added up to a powerful new approach for Best Buy that raised its stock price more than 50 percent in 12 months. To be sure, it may take a year or more for customers to change their habits at a scale that affects you financially. During this period, you are still relying on your old business model for earnings. But if you don’t start visibly taking steps to change that business model right away, it could affect your company’s market value. Investors are gauging your effectiveness based on their perceptions of the digital threat approaching your industry. If they consider you unprepared, they will have reason to pounce. At the same time, you have to proceed deliberately and strategically, rather than frantically and reactively. Panic is contagious. You are not looking for quick opportunities — you are plotting the new trajectory of your company. Use this time to develop your own sustainable, digitally enabled value proposition, to build out your own distinctive capabilities, and to sell off or shut down the assets you will no longer need when the disruption fully takes hold. Be bold and openly declare your intentions. Make it clear to your constituents — not just investors, but employees, suppliers, distributors, and other members of your business ecosystem — that you are preparing your own disruptive innovations. Continually reevaluate and refine your new approach, adjusting it to reflect changes in customer behavior and in your industry. Prototype new products and services and take them to market quickly, testing them with real customers. Bring the best ideas to scale. When your industry’s changes finally reach a tipping point, it will seem sudden to everyone else. But you’ll know better. Because of your early start, you’ll be ready with the capabilities you need. You can then move fast, seize the advantage, and lead your sector. Amazon has provided an example of this approach since the 1990s. Starting with books, then branching into other types of retail, and ultimately moving into general logistics and cloud-based computer services, it always had the same game plan: to expand gradually, taking on challenges when it was equipped to do so. It took Amazon 20 years to build up the requisite capabilities to master grocery delivery, an extraordinarily difficult challenge because fresh food can easily spoil. By contrast, Webvan, which also began in the late 1990s, started out with a home food delivery concept, overextended itself trying to cover the then-too-expensive “last mile” to the customer’s door, and went bankrupt. One company that has gained a right to win is PetSmart, a retailer of pet products and services. In April 2017, PetSmart made the largest e-commerce acquisition in history. It acquired Chewy.com, a pet supply site, for $3.35 billion — just a bit more than Walmart paid for the online store Jet.com around the same time. Chewy provided customer service capabilities that complemented PetSmart’s extensive retail store network and its multiple services (such as boarding hotels, grooming salons, and walk-in pet clinics). Chewy offered a high level of customer interaction, comparable to that of premium retailers such as Nordstrom. The company calls customers proactively to address service problems, and sends cards to thank people for their business. These combined capabilities give PetSmart and Chewy a much clearer identity and way to compete. You gain your right to win by building and maintaining a system of distinctive cross-functional capabilities — combinations of people, knowledge, IT, tools, structures, and processes, refined and developed over time. To preeminent business historian Alfred D. Chandler Jr., this “integrated learning base” was the single most important factor for business success. You already have some of those capabilities, or you wouldn’t have gotten this far, but you may need to develop or acquire others, as PetSmart did. Orient your business around those key capabilities. Make long-term investments to support them, and divest businesses that don’t fit. Another prominent example is Honeywell. In the mid-2010s, its right to win enabled Honeywell’s heating, ventilation, and air conditioning (HVAC) business to beat back a disruptive threat from Nest and other digital thermostats. Honeywell had a strong distribution capability; its people knew how to maintain strong relationships with HVAC installers and contractors, who referred customers to Honeywell’s digital thermostats instead of those from the startup. This gave the company time to bring its technology up to date. 4. Create your customers’ future. What does your customers’ future look like? Think about meeting their needs in a more fundamental way, so that they continually want more contact with your company and its offerings. Your mission, as Steve Jobs told his biographer Walter Isaacson, “is to figure out what they’re going to want before they do.” This will require imagination and insight; they won’t be able to articulate it if you ask them. Creating your customers’ future may require an obsessive focus on them. Make their problems go away. Remove the friction in their lives. Make things easier and less complex, while reducing the price they have to pay. The most effective consumer-oriented companies rely on privileged access to their customers. For example, IKEA has an extensive program for sending executives to the homes of customers, who welcome them because the company has enhanced their daily life. You can also learn a great deal from co-creating your products with customers, involving them in design and development. Adobe Systems, for example, routinely consults with graphics professionals in designing new packages for them. Google and Facebook had a huge advantage in the large number of sophisticated early adopters in their own workforce. The companies continually sampled their employees’ reactions and adapted their offerings accordingly. As marketing experts have pointed out since at least 1960, when Theodore Levitt’s groundbreaking Harvard Business Review article “Marketing Myopia” was published, customers are most compelled by outcomes: the results your products and services deliver, rather than the products and services themselves. This was how Philips profited from its halogen bulbs, the kind that retailers install in parking lots. Concerned about losing out to makers of lower-priced commodity bulbs, Philips set up a service to change the bulbs when they burned out, and continued its R&D on longer-life bulbs so the costs of that service would go down. Similarly, GE’s aircraft engines, Daimler’s trucks, Tesla’s electric cars, and Siemens’s power systems are all embedded with sensors, designed to provide analytics about not just the machines’ behavior (for better maintenance) but what the customer (the airline, truck driver, or power utility) is doing day after day, and how that experience might be improved. 5. Price to drive demand. Nearly every significant disruption reduces costs in some way. Customers respond more powerfully to cost reduction than to other types of increases in value. When you set your prices low, you attract customers, scale up your new business model, and force changes that make it more difficult for rivals to compete. Even high-profile disruptive competitors do not dramatically affect the rest of the industry until they become competitive in price. For example, it was only with its launch of the “affordable” $35,000 Model 3 in 2017 that Tesla began to compete with a wide range of other automakers. For most products and services, it’s best to build your response to disruption by lowering costs and looking for a larger customer base. Often this means using digital technology in inventive ways. Sometimes, as with Amazon and Uber, it involves pricing at a loss for the sake of long-term scalability and market share. Undoubtedly, you are already diligent about reducing costs. But you may not have gotten in the habit of strategic pricing: cutting costs to drive up demand. A notable example is IKEA, which builds a 1.5 to 2 percent product price reduction into its budget planning every year, as a forcing function. This requires its planners to figure out how to reduce costs significantly, and it has created the kind of customer loyalty that no disruptor can dislodge. 6. Profit from overlooked assets. Many digital disruptions take advantage of assets that have been underutilized. This approach is feasible because of the way digital technology reduces friction and reveals options. The sharing economy businesses that sell access to unused time in privately owned automobiles, production plants, homes, and office spaces changed their industries by monetizing their assets’ previously unused capacity. You, too, can disrupt your industry, by identifying ways to create value from underused assets. These may be found anywhere in your business. With a cloud computing installation, you may make more effective use of your computer processing power — and your programmers’ time. Or consider the stockroom of a big-box store. The space is big because of the scaling factor of labor. Once you have paid for the cost of putting in one pallet, putting in the next four is quite cheap. Because digital interoperability makes it easier to process multiple materials and products from multiple vendors, why not share back rooms and warehouse staff? Overlooked assets don’t have to be physical. They can include proprietary information, continually gathered data, or specialized expertise. For example, the Aravind Eye Hospital in India is one of the most effective cataract treatment centers in the world. It values professional expertise as a specialized asset. Each surgeon treats 10 times as many cataract patients per day, on average, as a similar surgeon would in the United States. The hospital, whose processes were modeled after those of McDonald’s, uses every means possible to focus a skilled surgeon’s time where it matters most: on the cataract operation. Everything else, including administrative work and referrals of complex cases, is handled by someone else. It may take time to develop a compelling and profitable approach to your assets. The first shared office space enterprises emerged in the early 2000s, but it wasn't until the mid-2010s that companies such as WeWork landed on a format and package that brought the concept mainstream. While you are developing your own approach, consider divesting the assets that hold you back or require ongoing costs. Every asset you own should contribute to, or benefit from, your differentiating capabilities. 7. Control your part of the platform. Disruptive companies don’t do everything themselves. They rely on the capabilities provided by others. Those capabilities will be more widely available as vast business-to-business platforms emerge: platforms such as Amazon Web Services, GE’s Predix, Siemens’s MindSphere, and the emerging Chinese “Belt and Road” system. A platform is a group of interoperable technologies that provide a basic infrastructure into which applications and processes from a host of companies can fit, working together seamlessly. The new digital platforms will help transform enterprises in the same way that their online predecessors, such as Google, Facebook, and Amazon, helped change consumer habits. A platform provides access to others on the platform, new ways of creating value from digital assets, and a much greater scale at minimal cost. Just as it’s vital to know what your company is best at, it’s critical to know where you can rely on others’ technology and solutions. Some companies thrive by becoming platform providers. Salesforce, for example, has used its capabilities in developing software-as-a-service and other cloud-based offerings to build an open ecosystem for sales and customer relationship management that gives the company a distinctive competitive advantage. By incorporating independent developers, system integrators, and consultants into the Salesforce ecosystem, the company has become a hub for a vast number of innovative businesses in multiple sectors, giving Salesforce unique access to information and leading trends. But you don’t have to own platforms to profit from them. Instead, focus on a part of the platform that gives you a right to win and establishes stable standards for an entire ecosystem. For example, if you are one of many component manufacturers for, say, servers or home-control devices, or one of many developers of similar software apps, you may lose value. But if you carve out a distinctive identity and role within other companies’ ecosystems, you can still draw value to you. You can be like Corning, manufacturing the Gorilla Glass used in the iPhone, along with many other kinds of specialty glass used for automobiles and other smartphones; or like HCL Technologies, which has parlayed its distinctive R&D and consultation capabilities into a refined outsourced technology business serving other high-tech companies. Because digital technology blurs boundaries among industries, you should use platforms to break free of the constraints of your sector. It is no longer necessary to manage your own supply chain to connect with suppliers and distributors. Apple, famously, is in music and video streaming, information technology hardware and software, Internet services, telephony, timepieces, digital photography, and retail. It is number one in most of those businesses. It doesn’t matter anymore what sector you think Apple is in; Apple is number one at being Apple. It has consolidated its market around one distinct identity. Choose carefully the platforms you join. Once you are intertwined with them, there may be enormous switching costs if you need to change. Protect your control over your customer data, intellectual property, and distinctive capabilities system. There may still be an advantage to integrating vertically; as Inditex (Zara), Amazon, and Haier have discovered, it can provide opportunities for differentiating your company. But the best option is to make a more fine-grained assessment of your costs and customers, and design your mix of vertical and horizontal activity accordingly. 8. Integrate, don’t isolate. The perception that disruption is imminent has many executives scrambling to launch digital side projects in the form of programs, products, and services that can stand on their own. There are many evocative nicknames for these mini-enterprises and isolated projects: Skunkworks. Pirate ships. Special forces. Labs. Quarantined units. The names convey the problem: a basic lack of connection between this subscale unit of activity and the core enterprise. To be sure, “pirate ships” have more freedom than the rest of the enterprise. They avoid the usual restrictions and requirements, the cultural antibodies that hamper creativity. They can even generate innovative products and services that seem to be the wave of the future. But because they are not integrated with the rest of the company, they don’t have the capabilities or support they need to be sustainable. Nor does the core business learn from them or benefit from their capabilities. Even if it succeeds in a narrow context, a pirate ship dissipates resources and makes it more difficult to go to scale with a new digitally enabled business model. In the end, transformation doesn’t happen in silos; it requires an enterprise-wide digital effort. One classic example of a failed mini-enterprise occurred at the North American typewriter manufacturer Smith Corona. In 1976, rightly fearing the onslaught of computer-based word processing machines, the company opened a digital research and development lab, staffed with newly recruited hardware and software engineers. But they located it in Danbury, Conn. — a four-hour drive away from the company’s headquarters near Syracuse, N.Y., where mechanical engineers worked on “real” typewriters. People at the two facilities had no regular opportunity to learn from one another or build common capabilities. The resulting new electronic word processors were easier to use and less expensive than personal computers, but they lacked some critical features (such as the ability to print pictures) that Smith Corona might have developed with more input from its customer base of students and writers. According to a case study (pdf) by Erwin Danneels, they were also plagued with manufacturing problems, which the rest of the company would have known how to manage. The company went through two bankruptcies and another acquisition before becoming a small manufacturer of thermal labels for barcode printers. Other well-known examples of pirate ships that ran aground are Ericsson’s AXE-N project — an asynchronous digital highway endeavor that cost the company billions before being shut down in 1995 — and the Xerox Palo Alto Research Center. This semi-independent lab is famous as the source of many ideas, including the graphical user interface that Steve Jobs adapted into the design of Apple’s first Macintosh computer. Xerox never gained commercially from the innovations it had funded. Instead of quarantining your digital efforts, embed them throughout your organization. Then experiment with prototypes that you can realistically bring to scale. Tailor them to make use of your existing strengths. Ensure that both the prototype and the main enterprise teams continually interact, learning from each other. GE has instilled this type of approach in all its new ventures. When it designs a prototype of seaport infrastructure embedded with sensors and analytics, for example, it conducts exercises that simulate activities at existing seaports. Truckers pick up shipments, trains stop to unload and load cargo, and employees move goods around the yard or into containers. Even regulators are simulated, querying the reports. Because of this, when it’s time to bring that complex new technology to scale, the company is ready. 9. Challenge the rules. Sometimes you have to ask for permission before you ask for forgiveness. When you are facing disruption, or launching a disruptive effort, recognize the leverage that comes from finding unrecognized gaps in the rules. A disruptive move will tend to circumvent regulations and governance structures that have been built up over time, wherein people internalize the behavior and turn it into a norm. For instance, years of compliance may lead a company to institute tracking sheets that, after 15 years, are no longer needed by the regulator or anyone else. But the tracking continues. If a regulation is preventing customers from getting what they need, it is likely to be ripe for disruption. Probably the best-known case involves ride sharing. In many cities, the regulation of taxi medallions led to artificial scarcities and monopolies. The first taxi competitors took advantage of this. Incumbent taxi firms, in response, have adopted some of the same measures the startups pioneered, including the use of apps to hail cabs. Nonetheless, non-medallion companies have had an edge in most localities, except for the few cities that put in new rules tailored to ride-sharing companies. Most regulations exist for a reason. If you can orient your practices toward that intent rather than the letter of the law, you will tend to succeed. In deciding how far to go, let the creation of value be your guide. You have little or no control over rules imposed from the outside. But your interpretation of them is under your control. Likewise, your rivals have their own interpretation of the rules. As part of the digital disruption game, then, compare your new competitors’ interpretation with your own. If their interpretation is looser, which of those constraints might you consider giving up as well? Alternatively, which breaches will ultimately come back to haunt them? And can you prepare your company to take up the slack? You may also compete against companies that matured under different regulatory regimes. Tech giants Alibaba and Tencent, for example, have a history in China of entering financial-services businesses that were off-limits to their counterparts in the U.S. and Europe. They’ve introduced mutual funds and wealth management systems, whereas Apple and Facebook scaled back their payments efforts because of regulatory concerns. Now all four of these companies will be operating in the same environment. 10. Define a new way of working. Most companies have been experimenting with new technologies for years. But the relatively few companies that embrace digital technology successfully have used it as a catalyst for changing the way they operate. They rethink how marketing, IT, and finance work together, and every aspect of their organization embodies that understanding. Start with recruiting. Don’t look for cloud architects or blockchain specialists. Assemble teams of people who can combine skills in business strategy, consumer experience, and advanced hardware and software development. (We call this BXT, for “business, experience, and technology.”) Along with your coders and spec writers, include creative designers, anthropologists, finance people, data analysts, and psychologists who can understand when something is drawing people in, as opposed to pushing them out. Look especially for “helicopter quality”: the ability to operate at two conceptual levels simultaneously, one close up to the detail and the other lofty enough to provide an overview, moving rapidly from one to the the other. Seek out these people at every level of the hierarchy, so they can make technological and design decisions on the fly that are in harmony with the larger business strategy. When you combine technological acumen, strategic purpose, and an appreciation for customer experience in one group, it enables you to imagine products and services that you wouldn’t have thought of otherwise. For example, Apple defined itself as the creator of a digital hub in 1999, and everything the company introduced after that, from the iTunes store to the iPhone and iPad, followed from that identity. Amazon defined itself as a store that connected with customers online, with a new and innovative interface that allowed people to exchange views about the value of its products. Scandinavia’s Danske Bank redefined its business around a peer-to-peer smartphone payments app that is used today by more than half the Danish population. Its subsequent products, including innovative mobile mortgage and wealth management offerings, followed naturally from that digitally enabled logic. In practice, it’s often surprisingly difficult to integrate business, experience, and technological acumen. Each typically involves a different functional silo, with its own skill base, priorities, and culture. In many companies, business strategy is the domain of financial specialists and top executives, who may not understand the options that digital technology gives them. User experience is often relegated to marketing or design specialists, who may lack the strategic perspective to create the right sort of vehicles for the company. And technology is typically the domain of software engineers, whose background may lead them to underestimate the importance of simplicity, emotional resonance, and intrinsic fulfillment to the customers and employees who use their systems. Typically, these three groups work separately, and they may not know how to talk together. A word like effective could mean low-cost to a business strategist, high-touch to an experience designer, and leading-edge to a technological specialist. If you can’t get them to work together easily at first, persevere. They will come to appreciate one another over time. If you don’t know where to begin, start with customer and employee experience. Best Buy CEO Hubert Joly, for example, began to reshape the company’s digital identity by canvassing employees about their experience on the job. When they complained about a faulty internal search engine that misinformed them about out-of-stock items, the search engine was immediately upgraded. That early step paved the way for continuous improvement of the customer-facing and backroom operations. Digital disruption can seem like a threat, but it can truly be a game-changer for you. Your opportunities to rethink your business have never been so great. The challenge facing you, no matter how mature your enterprise, is the same challenge facing any upstart: to create a new business model, value proposition, and system of customer-facing capabilities, positioning your enterprise for long-term success. Mathias Herzog is a leading practitioner in digital strategies for Strategy&, PwC’s strategy consulting business. Based in Seattle, he is a principal with PwC US. He primarily focuses on the technology, media, and retail sectors. Tom Puthiyamadam is a principal with PwC US, based in New York. He leads the digital services practice for PwC and oversees its Experience Center, which helps clients create next-generation experiences for their customers, employees, and partners. Nils Naujok is an advisor to executives in the chemicals and steel industries for Strategy&. He is a partner with PwC Strategy& Germany, based in Berlin. Also contributing to this article were the following people at PwC US: former global head of Strategy& Leslie H. Moeller; partner Mark Haller; principals Nicholas Hodson and Paul Leinwand; directors Namit Mehta, Martina Sangin, and Lina Woods; senior manager Miriam Ready; and senior associate Simon Jensen. This article is adapted in part from “The Coming Wave of Digital Disruption,” by Leslie H. Moeller, Nicholas Hodson, and Martina Sangin. Leslie H. Moeller, Nick Hodson, and Martina Sangin, “The Coming Wave of Digital Disruption,” s+b, Nov. 30, 2017: Origins and anatomy of the forces changing industries. Paul Leinwand and Cesare Mainardi, “The Fear of Disruption Can Be More Damaging than Actual Disruption,” s+b, Sept. 27, 2017: Research on the shift of value in industries reveals the perils of a hasty, ill-considered response. Norbert Schwieters and Bob Moritz, “10 Principles for Leading the Next Industrial Revolution,” s+b, Mar. 23, 2017: For companies that will run the platforms from which digital disruption will be launched.